We have been made aware that some people have been having difficulties completing the on-line energy survey. Investigations have shown that the use of Internet Explorer 11 may cause certain problems when trying to complete the form. The notice below explains the problem and offers some solutions. Soirbheas was recently short-listed for an Energy North Award in the category of “Best Community Project”. The awards are held annually to recognise and celebrate the contribution businesses and individuals have made to developing the energy industry in the Highlands & Islands. The ceremony took place on October 31st and was attended by Anne MacDonald, representing Soirbheas in her capacity as advisor to the board. Unfortunately, we didn’t win and sadly Anne’s well prepared “OSCAR” speak was not required! Soirbheas would like to take this opportunity to offer congratulations to all of the winners on the night and in particular to Galson Estate Trust, who won Best Community Project. Soirbheas is preparing an application to the Climate Challenge Fund for a grant to recruit and train a Green Deal Advisor to work in the Glen Urquhart and Strathglass areas. The advisor will provide a survey service within our communities. Homeowners will have the opportunity to have a survey undertaken by the advisor that will involve a home visit to assess the degree of energy efficiency within the property and to provide a series of recommendations to improving the energy efficiency of the property. Guidance will also be provided on the typical costs associated with any recommended works, together with payback times and notification and assistance in obtaining grant support towards meeting the cost of the improvements. As part of the grant application Soirbheas needs to gather some information from households in the area. To do this we have launched a survey to gather important data such as, the types of properties in our communities and the extent to which they already have energy saving initiatives in place, etc. The survey can be accessed and completed via the following link https://www.surveymonkey.com/s/LDDBBMH. We would like to encourage all Glen Urquhart and Strathglass residents to take the survey and in doing so, help us to make a successful grant application. Role: Community charity Soirbheas has secure funding from a locally owned wind farm and wishes to appoint a full-time Community Development Officer who will implement the plans of the Soirbheas board and help the community develop the projects to meet the organisation’s objectives. There may be some scope to take further interests in other income generating projects. Soirbheas recently launched a broadband survey as a first step to applying for grant funding to bring high speed broadband to the Glen Urquhart & Strathglass areas. We are working to a schedule with Community Broadband Scotland that means that we need to have the final survey results available, ideally by mid November. The questionnaire is now available to fill in via a link on our website’s home page. If you haven’t already done so, we would encourage you to do so now please. Soirbheas is a charity serving the communities of Strathglass and Glen Urquhart. It is not a vehicle for representing community views or feelings about wind farms or any other form of renewable energy project, for or against. It is, however, qualified to secure funding for the purpose of taking financial stakes in such projects and to distribute its earnings within the community, based on its charitable purposes. Soirbheas, a charity whose objects are, broadly, to strengthen and support the communities of Glen Urquhart and Strathglass, currently relies entirely on its income from its interest in the Corrimony wind farm for funds to repay its borrowing from Social Investment Scotland (“SIS”), meet its modest operating costs and, in due course, to apply money in support of its charitable objectives. If Soirbheas is to do more, or to extend the period over which it will be able to make a difference, it will need to look at alternatives for broadening its financial base. For this reason, one of the outcomes to which Soirbheas committed to with SIS was investment in other renewables projects. 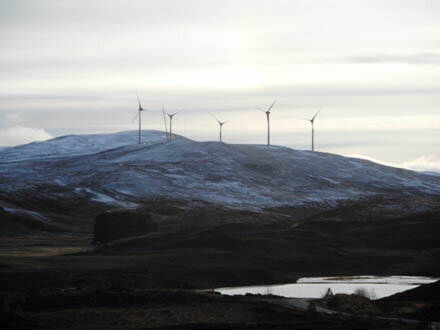 Soirbheas therefore registered an interest as potentially becoming the community body that would stand to receive money from wpd Scotland’s proposed Beinn Mhor wind farm, to be situated adjacent to the Corrimony wind farm. Soirbheas is also interested, in principle, in potential involvement in micro-hydroelectric generation schemes. In common with other charities, it will also look to secure grant funding where it can. It is best practice in the renewable energy industry for, at a minimum, a certain amount of money (at least £5,000 per megawatt of installed capacity) to be directed to local communities affected by renewable energy developments. Some communities, as has been the case with Soirbheas, go further by raising money to allow them to develop schemes or to buy into projects where funding can be found and it is believed that buying-in should secure better returns for the communities. Soirbheas has been notified by wpd Scotland that it was the only body that came forward by the deadline set by them when it invited community bodies to express an interest in the community turbine option being offered. wpd Scotland has indicated that, if the Beinn Mhor project goes ahead, Soirbheas stands (subject to at least five turbines being erected) to have the opportunity to acquire a stake in the project itself alongside wpd Scotland, assuming the return justifies the risk involved and the cost of buying-in and assuming that sufficient funding can be found. That said, the Beinn Mhor project is at an extremely early stage. wpd Scotland has optioned the site and is engaging with local stakeholders, but has yet to start gathering its own wind data. It has only recently applied for planning permission for the mast to collect this information. It is likely to be many months, potentially years, before it becomes clear whether this project will indeed proceed. Similarly, there will be much to do by Soirbheas if it is to put itself in a position to be able to buy into the project. Many members of Soirbheas joined the charity on the basis that, although they weren’t supporters of wind farms (or even were generally opposed to them), they recognised that it was better, were a wind farm to go ahead locally, that the community should benefit rather than not. As an organisation, Soirbheas is neither “pro-wind” or “anti-wind”. It is pro the communities it was formed to strengthen. Soirbheas was not formed to be a pressure group in relation to power generation projects and is not representing the views of the communities with regard to whether any specific renewables project should or should not go ahead. It has specifically made clear to wpd Scotland that engagement on the subject of a possible stake in the Beinn Mhor project is not the same thing as support for the project on the part of local residents. Soirbheas’ interaction with wpd Scotland is solely to explore the possibility for acquiring an interest in the project to capture the maximum possible benefit on behalf of the community, if the project proceeds. The first stage of this process is to see if agreement can be reached on a memorandum of understanding, which would document how the two organisations would work together on this specific issue. There exists within the area a number of organisations specifically formed to represent the views and concerns of local residents in relation to many aspects of life in our communities. All that would happen were Soirbheas not to engage with wpd Scotland would be that, if the project goes ahead, a community payment would most likely be split between Glen Urquhart and Strathglass and the opportunity to extract a potentially much larger amount of money for the communities from the scheme would be lost. Other than in respect of the potential for achieving some sort of financial interest in the scheme for the benefit of the Glen Urquhart and Strathglass communities, Soirbheas will not be a channel for communication between the community and wpd Scotland on matters relating to the progress (or otherwise) of the project. This should generally be done via the Community Councils which is the channel that exists for this communication already. There is also at least one organisation formed specifically to oppose the Beinn Mhor scheme and clearly local residents who don’t wish the project to go ahead (and who may even be members of Soirbheas) can join this group if they wish. Following an inaccurate report on Soirbheas’ activities contained with an article in the Inverness Courier on Friday, 2nd August, the following letter, clearing up the confusion, was published the following week. “Sir, regarding the notice of Mary Brook’s funeral (report 2/8/13), I write to clarify that Soirbheas is not “a group working to bring wind-farms to Strathglass”. It is a charity established for the benefit of the communities of Glen Urquhart and Strathglass. The charity was formed, with Mary, characteristically, as one of the very first to get involved, in response to a very generous offer from a local family who were hoping to build a wind farm and who wanted their community to have the opportunity to benefit from it, rather than external investors. That wind-farm having been completed, Soirbheas is now working to use its financial interest to benefit the community in which Mary lived by making it “more vibrant, growing and greener”. To help achieve these aims, where the opportunity arises, Soirbheas is willing to look at other opportunities to buy into renewable energy projects locally, such as wind farms and small-scale hydro-electric schemes, but these are no more and no less than a possible way of providing a long-term source of income to further community projects. The board of Soirbheas were shocked to hear of the terrible news that Mary Brook, a founding member of Soirbheas and former board director, was killed in a road traffic accident on Monday, July 22nd. Our condolences go to her family at this difficult time. Mary will be missed by all who knew her. Soirbheas has recently been working on the criteria for funding community projects. We have prepared a consultation document which and be downloaded here. Your views count and we want to encourage all members of the local communities to take part in the consultation process and you can do this by sending us your feedback using the Contact us page. The projects ultimately funded will benefit the whole of the Glen Urquhart and Strathglass communities and we would ideally like all members of the communities to contribute their thoughts on the consultation document, so please get involved and send us your feedback! We would like to encourage all of our members to attend the AGM this coming Thursday evening. We are entering a really exciting time for Soirbheas and the local community; assuming the wind blows enough we hope to have some money to spend in the next 6-9 months and we are encouraging community groups to come forward with ideas on how to spend the money! Please note that we will not have time to discuss specific ideas on how to use the money at the AGM but we will be talking about our plans to consult the local community to decide on the funding criteria for proposed projects. If you are a member of Soirbheas please show your support for us and the community by coming along to the meeting on Thursday and we will welcome you with a glass of wine and some nibbles! If you are not already a member, you can become one by simply filling in a membership form and bringing it along with you on Thursday. Interested in helping shape Soirbheas’ strategy for supporting our communities? Two of Soirbheas’ directors are retiring at the June AGM this year and the charity is keen to recruit additional directors to the board. At this stage we are moving from the project phase into the spending phase as the money from Corrimony Wind Farm is due to start flowing next year. Consequently, we are currently developing the framework that will govern how the funds will be spent within the community and this is about to be issued for community consultation. We are interested in individuals from a wide range of backgrounds, though you need to live within the Glen Urquhart and Strathglass community council areas to be eligible and this is a voluntary role. If you are already a member of Soirbheas you would be welcome to attend a board meeting as an observer to find out more. Should you wish to join, you will be given an induction pack and a briefing session to assist you. Soirbheas and Corrimony Energy have been very busy since last Summer. The wind turbines have been constructed; children from local primary schools have had fun filling time capsules, which are now buried under the sub-station; the turbines have been energised and are now producing power and we have recruited a part time Community Development Officer. Soirbheas will hold its Annual General Meeting on June 20th 2013 at 7:30pm at the Balnain Hall. All members are encouraged to attend. As of 1st April, Donna Green from Balnain has been appointed the Community Development Officer for Soirbheas, initially working two days a week. She can be contacted by email at DonnaGreen@soirbheas.org. For those who braved the very chilly wind to visit the site on Saturday (23rd March), thank you very much to the Girvans for answering all our questions. It was great to see the turbines in operation. Late Monday evening this week (March 11th), the wind farm was finally energised. Over the next few days, the turbines will be started and begin generating electricity. The Girvans are inviting members of the Strathglass and Glen Urquhart communities to visit the Corrimony windfarm on Saturday 23rd March between 10am and 1pm. Please report to the Corrimony Energy site office where visitors will be asked to ensure that all cars visiting the site are full to minimise the number of cars on the track. The remaining steps, having erected the fifth and final turbine, are to finish the work on the grid connection and complete the commissioning of the turbines so the hope is that the wind farm will be generating power before the end of the month!! Duration: Initial contract 12 months but potential to extend. Role: Soirbheas now wishes to appoint a Community Development Officer who will implement the plans of the Soirbheas board and help the community develop the projects to meet the organisation’s objectives. There will be scope to take further interests in other income generating projects.